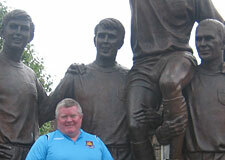 West Ham 0 vs Liverpool 3. 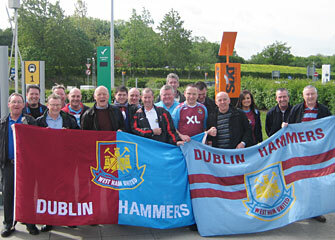 The merry band of Dublin Hammers assembled in the airport bar early on the saturday morning. 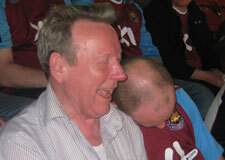 Due to the slightly later kick-off some members (surprisingly) decided to take it easy on the drink? The flight and transfer went smoothly and we were soon dropping our bags off at the Travel Lodge in Barking. First stop was the pub next to Barking station, members caused the kitchen staff a minor heart attack as 15 farmhouse breakfasts were ordered in one go! 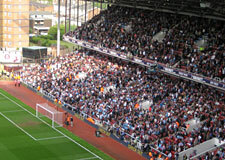 With full stomachs members drifted off, most heading down to the ground and the hammers store. With bulging bags, it was back to the hotel to down bags, dump coats, as the sun had come out, and then back down to the ground where the drinking began in earnest! The Queens was popular, as was the supporters club. I’ll keep the report of the match short... we were one down within minutes and were left seriously wanting in several positions. As DiMickey fell over with an open goal at his mercy I knew it would not be our day! At least one member of the travelling party won money on a 3-0 loss! After the game it was back to the hotel, something to eat and a few drinks. Some members stayed in the hotel bar, while the majority headed on out again! There were not many members up by the time I headed off on the sunday morning. Most members ‘did the usual sightseeing tour’, others met with friends, however all met up at ‘The George’ at Liverpool street at 6pm on sunday evening! The ride to the airport was loud and boisterous as various members took it in turns to lead a sing-song. We also had to stop briefly to get 2 bags that had been left in the hotel by the bus driver. Once at the airport we camped out at the bar until it was time to board the last plane back to Dublin! A great trip, great weather and loads of laughs... the result? we won’t worry too much about that! 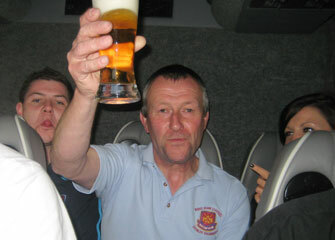 Well done to Jim and the committee for yet another top trip!